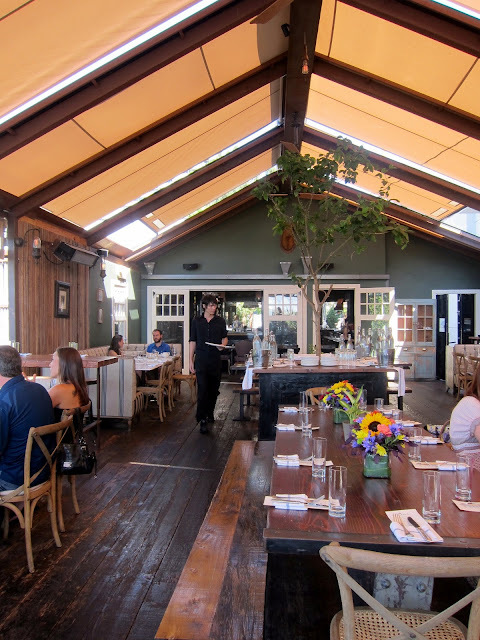 Near the west end of the Sunset Strip lies an unassuming restaurant that boasts the trifecta coveted by all restauranteurs: good food, good service, and good ambience/ view. Eveleigh joins the league of restaurants that lacks signage. Or if there was a sign, they do a great job hiding it in its leafy "Secret Garden"-esque entryway. Sign or no sign, Eveleigh doesn't give off a pretentious or ultra-trendy vibe. Rather, it combines rustic and chic in a welcoming way. Though I visited during the day, I imagine evenings at Eveleigh would be romantic in a feel-good, country-comfort sort of way. Because I was here for a special event (Hi, CC! ), we enjoyed our meal from a set menu. 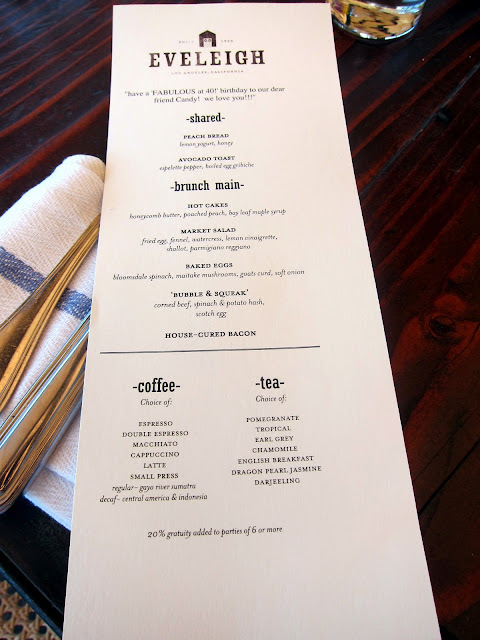 Most, if not all, of the items on this menu is on their regular brunch menu. We sat at a long communal table, so communal eating was appropriate. Having tasted at least of bite of each of the entrees, I enjoyed it all, but vote the hot cakes and peach bread as my faves. The fusion of the honeycomb butter and syrup on the hotcakes was perfect, even for me who only recently started to appreciate pancakes. As for the peach bread, I'm in the process of trying to re-create that in my own kitchen. Will keep you posted. Overall, Eveleigh is one of those places that may be under the radar, but is worthy of checking out, whether for brunch, dinner, or post-dinner drinks. So, what are you waiting for?